The Adventures of Team Wil-Sun: Stitch-a-Long update - a changing of projects! Full disclosure -- I didn't finish the butterfly piece in time to give it to my Mom for her birthday... We decided to celebrate on the Saturday night rather than on Sunday (her actual birthday) ... and while I might have gotten everything stitched if not framed for Sunday night, well, it just didn't happen in time for Saturday night. I'm really pleased with it -- I know my mom will be too! Now, I know what you're thinking... what's next? It's a Glorafilia kit I bought nearly 20 years ago while living in the UK. A girlfriend came to visit and we did a little road trip to Wales, stopping in Chester on the way back to London. We went to an amazing stitchery store -- now gone, I think -- and each of us purchased absurdly expensive needlepoint kits. So expensive that we couldn't make eye contact as we left the store, and said, "We shall never speak of this again." This "craft that dare not speak its name" has languished with me, moved from house to apartment to house, and though I occasionally opened it to look at it, it made me feel anxious because it incorporates needlepoint stitches beyond basic basketweave or tent stitch. But after I successfully stitched and finished Mr. Fox, I feel more confident. And, hopefully, with the support of my awesome stitch-a-long colleagues, I'll get through this, too! It's a big piece -- about 18x16 inches -- and there's a LOT of wool. It's so big I can't fit the whole thing on my floor stand... but I decided to tack down half of it and get to work. I'm clearly going to have to learn as I go along -- my instincts tell me to do the foreground items -- that is, the swans -- first, so that I can control the shapes of them. But at the same time I always like doing the light colors last so they don't get grubby. I started with the feet ... not sure how to do the outlines. I decided to try just stitching all the dark blue and then add the stem stitch outlines afterward. Not sure that was the right decision, but I think it is turning out okay. As for the swans ... I realized pretty early on ... okay, after some frogging! 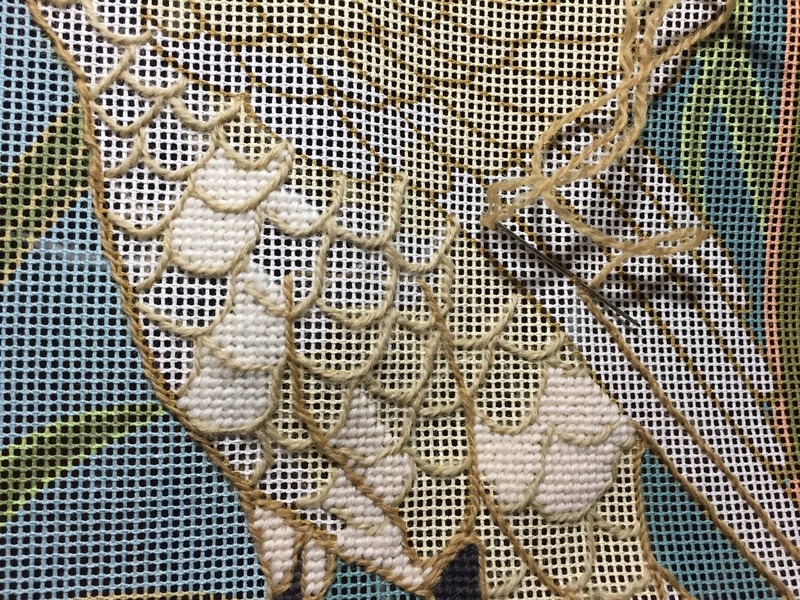 ... that the outlines of the birds and the feathers needs to be done first, and then the feathers filled in after. So I've been playing with that. I think my next steps are to finish the outlines of the swans, and then work on the outlines of the leaves -- just to get all the shapes defined. Once I've done that I'll figure out how I'm going to stretch this massive canvas on a frame so I can work on it! I really enjoyed the floor frame for my last project and feel like it really kept me from straining my hands and wrists. So that's something to sort out in the next few weeks. 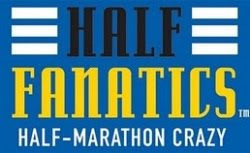 I'm writing and scheduling this post early as I'll be out of town on the 30th -- so apologies if I miss a late addition or update to the participants! We're headed down to Mount St. Helens to climb to the crater rim -- wish us luck! When we return to sea level, I look forward to seeing all the amazing work my fellow stitchers are doing! Avis, Claire, Gun, Carole, LucyAnn, Kate, Jess, Sue, Constanze, Debbierose, Christina, Kathy, Margaret, Cindy, Helen, Steph, Linda, Heidi, Jackie, Hayley, Tony, Megan, Catherine, Deborah, and Connie. The butterfly is a lovely gift, and your mother's going to be delighted with it. The swan kit is fabulous, and if you think about the 20 year old price as today's price, it's probably not quite as scary! I have a thought about protecting the swans once completed: maybe a mask of freezer paper lightly adhered with a cool iron, or even a fabric mask basted over once you have a little background filled in all round? 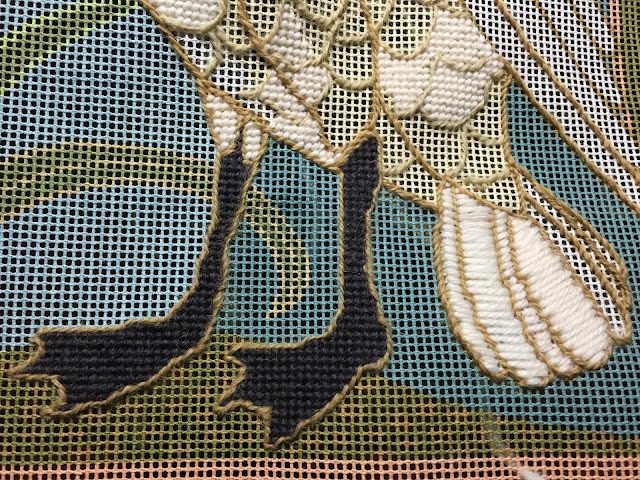 I've decided that I can actually do all of the outlining first -- swans, feathers, cattails, leaves, swirls -- and even the borders before going back and filling in the swans, now that I know this "works". So that's the new plan! I do like the idea of masking them off, though! The butterfly is stunning! I completed a Glorafilia project in the 1980's and I still remember doing all the different stitches. The instructions explained which bits to do first otherwise I wouldn't have had a clue. Yes, it was an expensive kit but well worth the money. Your swans are going to be beautiful and I'll enjoy watching them appear. Enjoy the climbing! Thanks Avis! This kit did say to do outlining first, but of course I had to test it for myself since that didn't make sense to me! The climb was glorious -- harder than it should have been (I'm not a fan of bouldering), but our weather was perfect and we made it up to the crater rim and back down safely. I'll post about the climb later this week! wow! 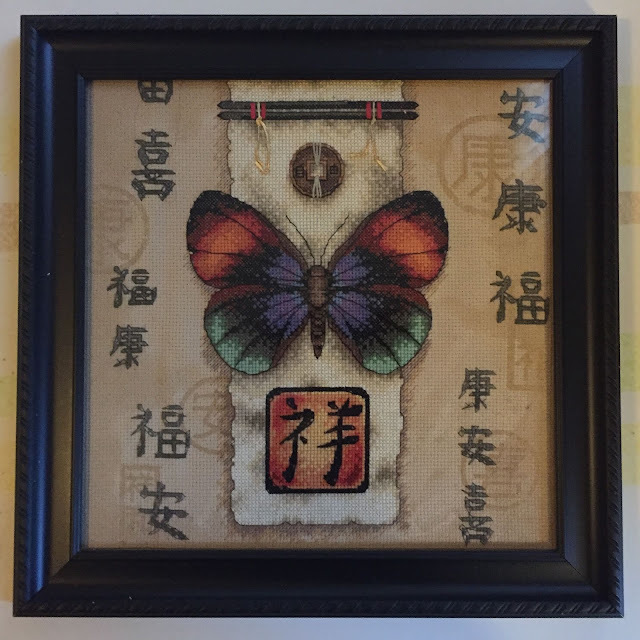 your framed butterfly looks stunning. Your Mum is going to love it. As for the swans - I am so looking forward to seeing that take shape! Thank you Claire! I'm really happy with how it turned out, and can't wait to give it to my Mom. Thanks, Megan! We also looked for that shop several years ago on another visit and couldn't spot it. Probably the better for my wallet! Thanks Sue! We had perfect weather for our climb on Friday -- I'll post pics later this week. We kept saying to other hikers that we were the luckiest 100 people of the season! 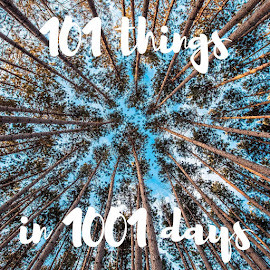 (Permits are limited to 100 people per day, and you have to book them months in advance and just hope for good weather!) You'll probably be sick of looking at the swans by the time I finish them, but this will be a great autumn/winter... and beyond project. Your butterfly is beautiful, I'm sure your mother will love it. 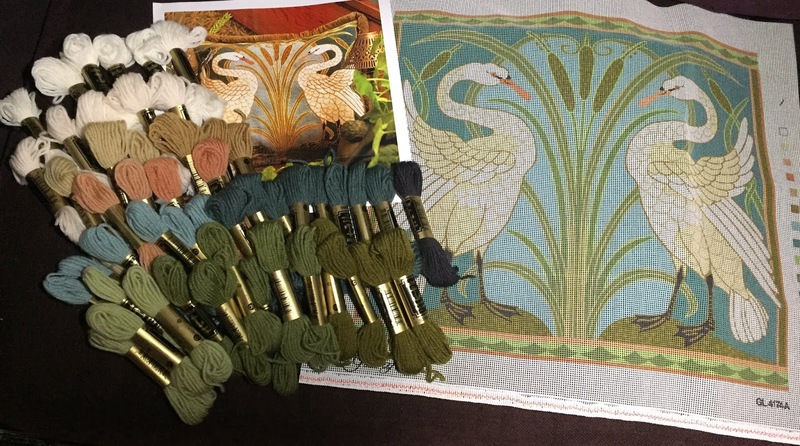 I just love the swan tapestry, so elegant, I'll look forward to watching this one develop. Thank you Margaret! I'm really pleased with the butterfly and how it looks in the frame. 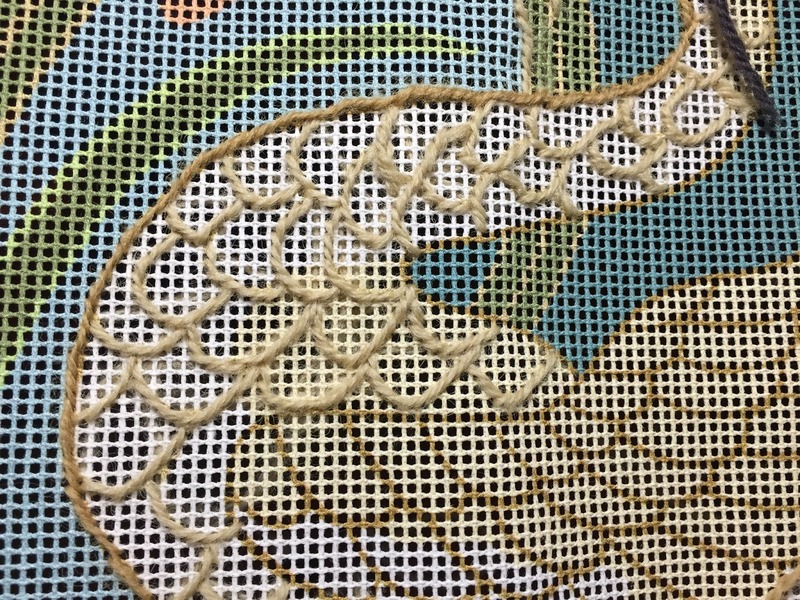 Expect to see the swan tapestry for a long time to come! First..your moms birthday present is so great! I´m sure she will be happy! 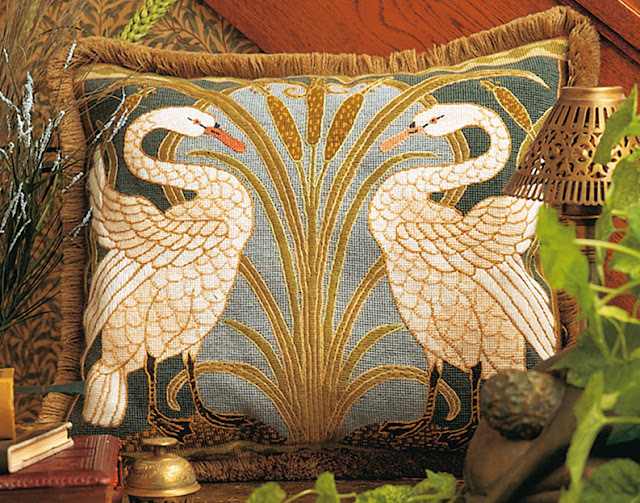 Then the swan embroidery. Good luck with that one and I´m sure you´ll managed all the stitching well! Thanks, Gun! My Mom taught me how to stitch, loves butterflies, and is half Chinese, so I can't wait to give it to her! The swans also remind me of the detailed stitching she used to do, so maybe I'll be able to bring myself to part with it... eventually! Your moms present turned out great! She is going to love it. Love your next project. It is going to be beautiful. Thanks Linda! I'm looking forward to the big project, too -- now that I think I've figured out how best to approach it! Lots to learn on this one. Didn't we almost break the front window of the shop in Chester while reaching for a kit? Suz -- I think we almost broke a display case trying to get one of these massive kits out of it ... luckily not the entire shop window. :) What kit did you buy there? I honestly can't remember! I'm sure your mom is going to cherish the butterfly - it is so beautiful! I am amazed at the intricacy of your swan project and am looking forward to seeing the updates. Thanks Connie! The swans are going to take a loooong time, so hopefully you won't get bored with the updates! That looks amazing - what a wonderful present. Can't wait to see how you progress with the swans. Your butterflies are really stunning! I’m sure your Mum will love having them on her wall. Your swans look like a big project but what a beautiful one! And we all have things we’ve purchased that we don’t wish to think about too much! In canvaswork we were taught to work the foreground first then the background. Always seems backwards to me! And try covering your work in tissue paper or something to help keep it clean. Though things always seem to make their way onto these large projects! Thanks Catherine -- I think I've worked out that I can just do the outlining and fill in the swans last, so I can still "shape" the foreground but hold off on using the white and cream. So for the next few weeks I'm going to focus on finishing the outlining on the right swan and working on outlining the center leaves and cattails. congratulations on the butterfly, it is beautiful! And good luck with the needlepoint. I'd love to try a piece with different stitches beyond the basic tent stitch. I've never found a design i wanted to stitch though! Thanks Wendy! I remember my Mom working on an elaborate needlepoint cushion when I was a kid, with 16 squares, each done in a different stitch. (I bet she still has that cushion somewhere!) 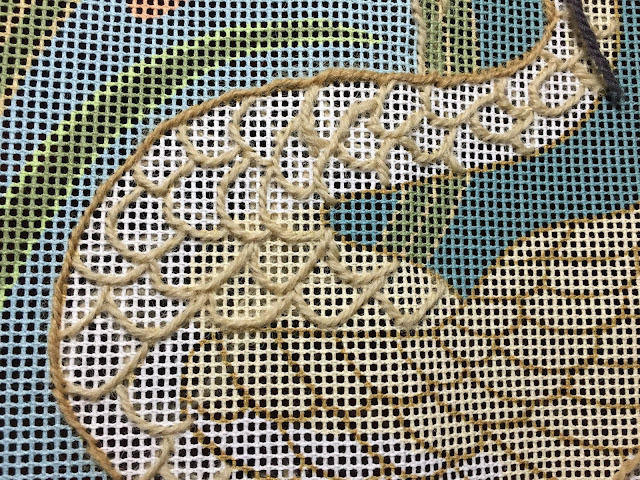 These few different stitches is quite challenging enough for me... but maybe it's a gateway to more complex projects? Your mum is going to love it. The finish is absolutely gorgeous! Thanks, Jess! I got really lucky and found the perfect frame on sale on my first trip to the craft store! Thanks Helen! It'll be a while, but progress is progress!